Searching for the best tofu press for home or light restaurant use? We’re here to help. On this page you’re going to find our in-depth tofu press buyers’ guide, complete with detailed product reviews and our experts’ top picks for the best tofu presses of 2018. If you don’t have time to read our entire review, do yourself a favor and check out our number one pick, the TofuXpress. Tofu is one of the most widely consumed proteins in the word, with hundreds of millions of people regularly preparing and eating the soy-based product all around the world. But creating restaurant-quality tofu dishes at home isn’t as easy as it seems – you can’t just go buy a block of tofu, chop it up, and expect it to taste as good as when the professionals prepare it. That’s because nearly all store-bought tofu has a high water content that needs to be drained before use: but how exactly are you supposed to do that? Most home tofu cooks resort to drastic measures, wrapping their tofu in paper towels and then stacking dishes and frying pans on top of it for weight. Not only is this ineffective and inconsistent, but it can also create a mess and add far more cleanup work than is needed. Luckily though, there are a number of great tofu presses on the market which make the task of pressing and draining tofu blocks simple and mess-free. Here we’re going to go over our top 7 expert-chosen picks for the title of best tofu press of 2018. Tofu presses come in all different shapes and sizes, but they all pretty much work the same way: to drain excess moisture from your tofu so that it will cook better and more effectively absorb the flavors of the ingredients you’re cooking it with. Since choosing the right tofu press can be difficult, our team of experts has put together an in-depth list of their picks for the best tofu press of 2018. 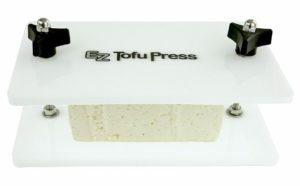 Easily taking the number one spot on our list as the best tofu press for 2018, the TofuXpress is a box-style tofu press which provides hassle-free and mess-free draining without the constant monitoring and adjustments needed with plate-style presses. Assembling and taking apart the TofuXpress is a piece of cake, which makes cleaning it a cinch. Plus, the box-style design captures drained liquid for simple effortless disposal. 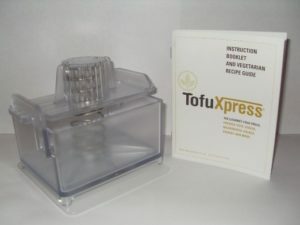 While the TofuXpress may seem a little expensive to the cook who only works with tofu on rare occasions, it provides tremendous value for the buyer who prepares tofu-based dishes on at least a weekly basis. All you have to do is put your tofu block in the press, set it in the fridge, and come back later to fully-pressed, ready-to-cook tofu. If you’re looking for an affordable plate-style press, look no further than the Super Tofu Press. Constructed from BPA-free plastic plates and food-grade stainless steel bolts, washers, nuts, and springs, the Super Tofu Press is a durable kitchen tool made to withstand tens of thousands of uses – for the majority of users, it can last a lifetime. Using four-spring technology, the Super Tofu Press is ideal for use with firm and extra-firm tofu to create dry blocks which are perfect for both salads and frying. All you have to do is occasionally adjust the top-mounted wingnuts to increase the pressure on your tofu. In addition to working great for tofu, this press can be used with a variety of vegetables and other common kitchen ingredients. Similar to our number two pick, the EZ Tofu Press is another plate-style tofu press which works by tightening its top wingnuts from time to time. 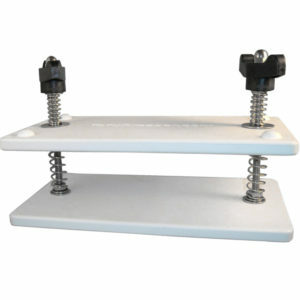 Unlike the Super Tofu Press, however, the EZ Tofu Press does not use springs to provide resistance and prevent an uneven tightening. Instead it requires the user to monitor and lightly adjust their tofu in order to prevent over-tightening and cracking. 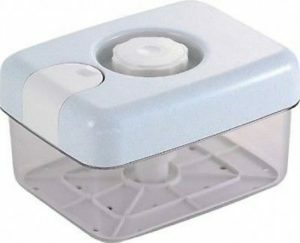 Still, for the occasional tofu cook who is looking for a cheap and effective press that can be quickly taken apart and thrown in the dishwasher for no-work cleaning, the EZ Tofu Press makes for a smart value-priced purchase. Perfect for the most discerning tofu cooks, the Raw Rutes Tofu Press (Ninja) is easily the most stylish and high-end press on our list. Not necessarily for the low-budget buyer, the Ninja is constructed out of solid 304-grade stainless steel for an extremely long expected product life. With its 4.5 pound top weight, all you have to do is put your block of tofu into the press, set the weight, and come back later to enjoy tofu that’s much drier and ready to prepare. The Raw Rutes Tofu Ninja Press is able to remove as much as 35% of water in just 15 minutes of pressure. 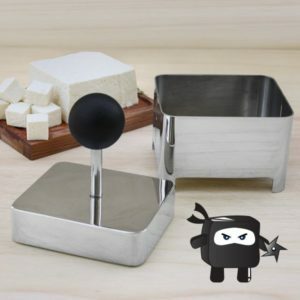 Although it does come with a hefty price tag, the Ninja is one of the simplest yet most effective tofu presses on the market. 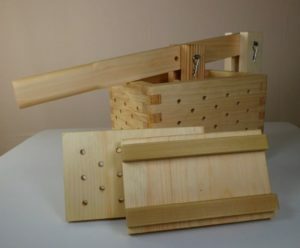 Another high-end box-style tofu press, the TM1202 Tofu Maker & Press is a traditional-style tofu press handmade in the United States out of sustainably sourced eastern white pine and poplar woods. Another press that’s not designed for the infrequent tofu chef, the TM1202 is a solid, well-constructed wood tofu press that is both highly functional and a unique counter-top conversation piece. In addition to functioning as a tofu press, the TM1202 can also be used to prepare tofu from scratch starting with just soy milk – making this multi-function tool great for the buyer who enjoys preparing their own homemade tofu in addition to using store-bought blocks. If you’re on a tight budget but are set on a box-style tofu press, the Tsukemono Japanese Pickle Press is a smart buy. While not intended specifically for tofu pressing, the unique design works well for tofu as well as plenty of other commonly found kitchen ingredients. With the Tsukemono Japanese Pickle Press, pressing your tofu is easy: all you do is set your block in the box, fasten the lid, and slowly turn the knob on the top to add pressure. Thanks to its three liter capacity, the Tsukemono is great for both single servings and family-sized pieces of tofu. On a tight budget and looking for the most affordable-yet-effective tofu press out there? 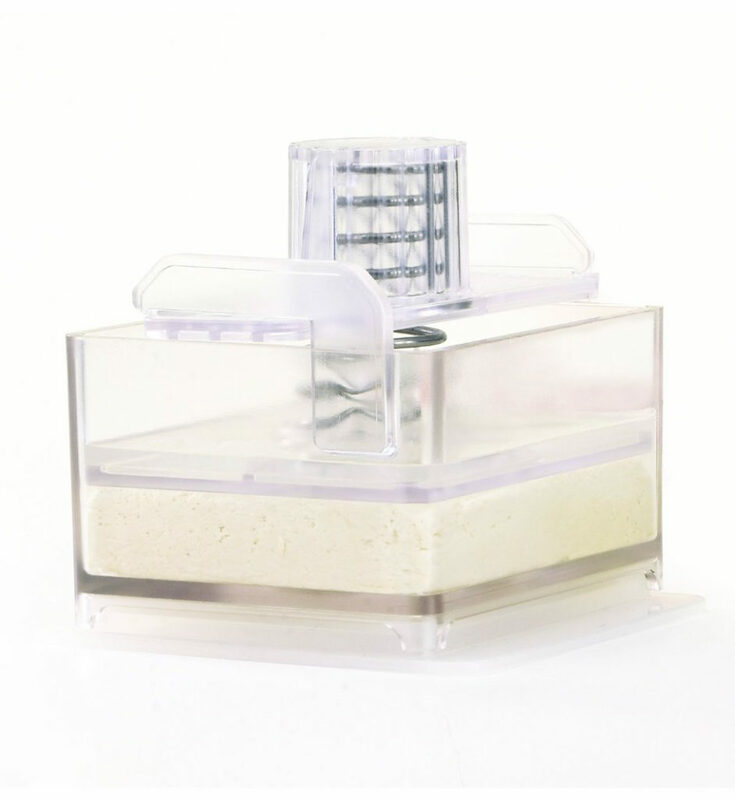 The Handy Pantry plastic tofu press has you covered. Easily the most low-cost press to make our list, the Handy Pantry is both easy to operate and dishwasher safe for simple cleanup. 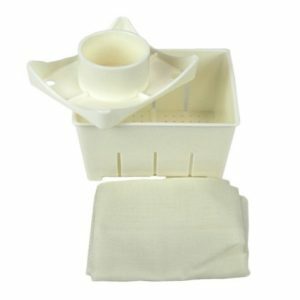 While it lacks the long-term durability of many of the tofu presses higher on our list, the Handy Pantry plastic tofu press is a good buy for the infrequent tofu cook who wants a low-priced tool that can easily be stored away out of sight when not in use. If you only prepare tofu once or twice a month and aren’t looking to spend much money, the Handy Pantry press well be the press for you. A tofu press is a practical kitchen gadget which simplifies the process of pressing and draining tofu blocks – it’s the most effective way how to press tofu. Traditionally, most home cooks would just wrap their tofu up in paper towels (or more expensive cheese cloth if they had it) and add random weights such as heavy plates and frying plans on top of the tofu block to press it down. Of course this method is imprecise and often times messy. Today, however, there are a number of great tofu presses available on the market which make the task much simpler and far less messy. While they all function the same way – adding pressure to squeeze water out of tofu – these presses come in two different styles: plate-style tofu presses and box-style tofu presses. The most basic type of tofu press, the plate-style presses function just like they sound they should: by using two plates to squeeze liquid out of your tofu blocks. Typically held together by anywhere between two and four screws, these plate-style presses feature adjustable wingnuts on the top which can be twisted to increase or decrease the amount of pressure being exerted. These presses come both with and without tension springs built into their frames. 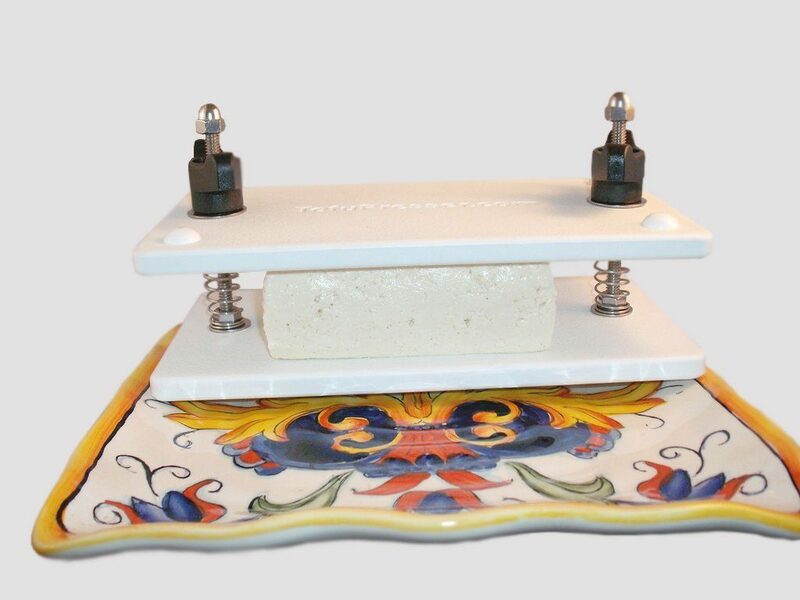 Great as a low-cost, easy to clean and store tofu press, the plate-style presses require regular monitoring and adjustment of the wingnuts in order to maintain steady drainage as the tofu block loses water and shrinks. These are fine if you’re making the occasional tofu recipe, but become time and labor-intensive if you’re preparing tofu daily. Perfect for the frequent tofu preparer, box-style tofu presses are typically considered a step-up from cost-efficient plate-style presses. That’s because, unlike plate-style presses which constantly need to be adjusted, box-style tofu presses can be loaded and forgotten about – once the tofu is in the box and the lid attached, most models continue to add pressure until the right level of firmness is reached. If you prepare tofu on a regular basis and want effortless tofu that is consistent in its moisture content every single time, invest in a quality box-style press. The only downside, however, with this type of press is that they’re typically larger than plate-style presses, and thus take up more counter or cabinet space. Most cooks who are new to working with tofu may be a little surprised to find out that it comes in a myriad of different textures and consistencies. Most of the solid blocks of tofu that you buy in the store will be of either the firm or extra-firm varieties – these are perfect for use with your tofu press. The more firm it is (the lower the water content), the easier it will be for your press to process out the remaining moisture. If you’re planning to fry your tofu, you want as little water remaining as possible, as the excess moisture can react with the hot oil and cause a messy and serious danger. On the other end of the spectrum, silken tofu (and other soft styles of tofu) are great for making into sauces, but simply don’t work for pressing. Because of their high moisture content, a press is not going to be able to substantially remove water – at least not enough to make it solid enough for cooking. All-in-all, we here at Respectable Reviews believe that the best tofu press for you is likely to be the one which fits most with your budget, cooking, and storage needs. Super low-cost presses like the Tsukemono and Handy Pantry are great for economy shoppers who only prepare tofu occasionally, while the TofuXpress and Super Tofu Press work well for the frequent, yet low-budget buyers who want a reliable tofu press at a fair price. Then there’s the high-end models like the TM1202 Tofu Maker & Press – which is hand-crafted in the United States out of sustainably sourced American wood – and the Raw Rutes Ninja, a fully functional tofu press which boasts a modern and stylish stainless steel construction for aesthetic pleasure, simple cleaning, and effortless pressing of firm and extra-firm tofu varieties.